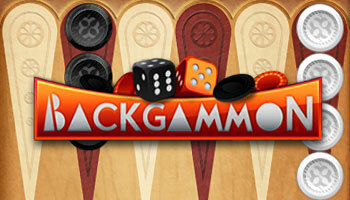 Backgammon is one of the oldest classic strategy games for two players. The objective of the game is to bear off all your pieces from the board. Each player start with 15 pieces on their starting positions(the opponent has a mirrored arrangement). The players home row is opposite the other and they have to move their pieces in the opposite direction around the board (clockwise or counter-clockwise). After rolling the dice, players advance their checkers according to the number shown on each die. All pieces must first arrive into their home base, then the player can start to remove them from the board. Any piece stacked two or more is safe from capture but single pieces (called a blot) are vulnerable. When the opponent lands on them, they are captured and placed on the middle bar. The captured pieces can re-enter the game but on the furthest point from the player's inner table. When you roll a double, you are able to play that number four times (if the board will allow). So, a point hosted by two or more of the opponent's pieces is said to be blocked and when 6 points in a row are blocked, it's called a "prime". The opponent is unbable to traverse it. Winning Backgammon depends on a combination of strategy and luck (because of rolling dice). Dice can determine the outcome of a single game, but over a series of many games, the strategy will determine the outcome. Players must choose from numerous options for moving their pieces and anticipate possible counter-moves by the opponent. To reduce the possibility of cheating, players best use precision dice and a dice cup to roll their dice. When one player has not borne off any pieces by the time that player's opponent has borne off all fifteen, then the player has lost a gammon, which counts for double a normal loss. 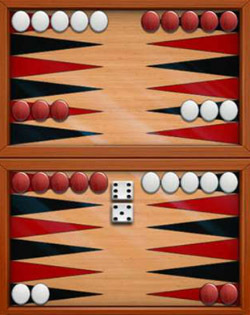 When the loser has still pieces on the middle bar (or in the opponent's home board), then the player has lost a backgammon, which counts for three times a normal loss. Backgammon is one of the oldest board games. It was popular in the Byzantine empire, but also the ancient Egyptions played a variant called "senet". The game is played worldwide. No matter where you are, or what language you speak, everywhere people play and enjoy it, even in tournaments. There are several variants like Acey-deucey, Hypergammon, Nackgammon, Russian Backgammon, Gul Bara, Tapa or Tavli. To win by moving all of your checkers to your home board and then bear them all off. Set up the board like this and figure out which is your home board so you'll know where it is that you have to move your checkers to before you can begin to bear them off.